Hearing myself say that I signed up for a half marathon was like a trip to a different galaxy. 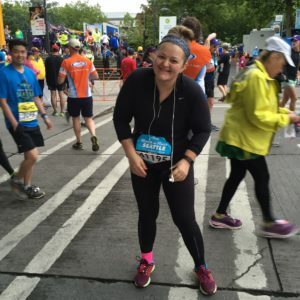 Running a half marathon (or, like, running at all) was never a thought that crossed my mind. I spent many years actively AVOIDING running so I never in a million years would tell you that someday I would willingly sign up to run 13 miles at once. I even failed gym class in high school one year because I skipped class when they wanted me to run the mile.. and skipped class on the make-up day, too. True fact. I had never even completed a 5k but here I am, signed up for a HALF MARATHON? Who does that? Why not a 10k? Because I’m crazy, that’s why. 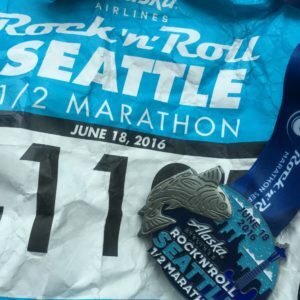 I signed up for the Seattle Rock’n’Roll 1/2 marathon on a bit of a whim, but I knew if I spent too much time debating it I would end up talking myself out of it. When I signed up, it was about 4 1/2-5 months out and I weighed around 220 pounds. I only ran a few miles a few times a week and was in no way serious about cardio. I started training pretty much immediately. 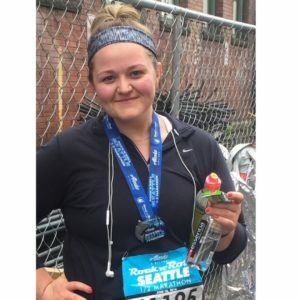 I researched a lot of different types of beginner half marathon training outlines online and settled on one that gave me enough flexibility to work with my schedule. 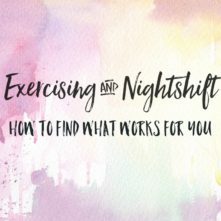 Because I work 12 hour overnights 3 days in a row, I knew I wouldn’t be running on those days when I first started training. For the first two weeks I also reinstalled the Couch to 5k app. I used the runs that were further into the program just to get myself accustomed to running. It’s hard on your joints, especially when you’re overweight, so I didn’t want to get all gung-ho right off the bat and hurt myself. That almost worked. The only other race I’ve ever signed up for was a 5k around Lake Harriet in Minneapolis. It was when I was close to my heaviest but it was for an organization that I love, Be the Match so I went for it. I could walk 3 miles, no big deal right? Well, my ankles hurt so badly after less than a mile into it that I turned back and didn’t finish. I was now running around that same lake twice while doing my training. I was feeling pretty good about my progress and how much healthier I’d become. About 2 months into training, I was following a template of alternating the lengths of my runs and having one long run a week. I started noticing a tightness in my the back of my heel when I wasn’t running. It was dull at first and I ignored it. It ended up getting worse and became Achilles tendonitis. I had a big knob that had formed on my Achilles and was needing to ice it after barely any time on my feet. I was freaking out and getting really concerned about the upcoming half marathon. I took a week off of doing any physical activity but was warned not to run until it was completely healed. I knew that wouldn’t be an option as healing time for that injury can vary from 2 weeks to months. I decided to try to keep up my cardio and I started biking. I knew it wouldn’t be the same as running and I wouldn’t be practicing the motion, body mechanics and breathing that are all important elements to distance running. I didn’t have much of an option though, so I figured it was the best I could do given the situation. I biked almost everyday, even on workdays, between 10-20 miles. I was still determined to do this race. I ended up losing about 25 pounds during training. The last leg of it seemed like a plateau because it was coming off so slowly. I was annoyed by it, sure, but I also knew that happened frequently when doing endurance training. I had dramatically increased my physical activity so obviously my body is going to respond differently than it was previously.
. I had come this far and I knew that I would regret it if I backed out. The day of the race I was up at 4 a.m. and almost in tears from my nerves and anxiety. I heated up my pre-race breakfast and got dressed. I had no idea what was in store for me or how the day was going to go but I went into it knowing I was going to give it my best. The first 6 miles flew by. It was such a rush just being there, running through Seattle and feeling like a real runner. My adrenaline was powering some pretty speedy miles. I know that’s a total rookie mistake.. coming out of the gate too fast and burning out too quickly but it’s one of those lessons you only learn through making the mistake yourself. I hit my fastest mile and fastest 5k ever up to that point in the first half of the race. I got a bit lightheaded around mile 6. I remember that because that was the first time I had looked at my mileage and time. I brought a Larabar with me so I ate half of that and was fine. The next 3 miles after that were fairly easy, too. Slower, but I physically wasn’t DYING. I just enjoyed taking in the sights of Seattle and reading the signs people were holding as I ran by. In typical Seattle fashion, it started raining a little bit but it was light and felt nice. I hit mile 9 at a right around 2 hours. This is when I really realized exactly what everyone on the internet meant when they said to pace yourself. Then, the last 3 miles were probably the most excruciating miles I’ve ever run and maybe ever will run. I wanted to die, cry, and quit or whichever came first. Mile 10 was through a long, dimly lit, warm, uphill tunnel with no airflow that lasted over half a mile. It was miserable and many people were walking through this, so at least I knew I wasn’t the only one struggling through it. It was easily the hardest part for me as it was a serious test of my willpower. The last of the race after the tunnel was over an off ramp back into the city that continued to show us those sweeping views of the skyline. It was on this off ramp during mile 12 that I noticed how swollen my fingers were. It was here that I almost cried, too. I don’t know if it was my first experience with my calves cramping, my ankles screaming or just the sheer sense of accomplishment I was already anticipating. I had to really, really push through the last mile. I remember seeing a photographer on the side of the road and wishing I had the energy to run over and punch him before he could take my picture. The moment I crossed the finish line all of the things I’d just gone through to get there seemed so far away. I still don’t have the right words to describe how incredibly proud of myself I was as I passed over that line. I felt like all of my efforts and sacrifices for my health I had made over the last year and a half had been validated. The sense of accomplishment was something so different from anything else I’ve experienced and I think it’s something everyone should do at least once. I never had a goal to be a “great” runner and I still don’t. That’s never going to be the end goal. I didn’t really even like running all that much. 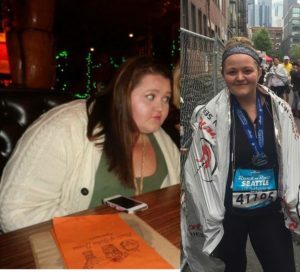 My first half marathon was about so much more than becoming a runner. It was about recognizing and celebrating that my body is capable and strong now. It was about pushing myself out of my comfort zone and doing something I never believed I could. It was about the lessons, the mental and physical breakthroughs that come with trying new things. It was about seeing how my life has transformed in the last year and done a complete 180. It was about taking a day to appreciate that I’m now a doer. I always had been a watcher. Now I was finally being a participant and not a sideline observer in my own life. remember feeling so present in that moment, allowing myself to really feel it and soak that finish line moment in. The sights, the sounds and how I felt. I took a look around, tried to gather myself and then I spotted my boyfriend and started crying again. As much as I did this myself, when I saw him I was reminded about the support system I had to get here. I’m a lucky girl. My first half marathon has been one of the best moments out of this journey for me and I wouldn’t have changed one thing about it. Even the physical and mental pain I had to get through proved worth it in the end. As we walked to the car (okay, I hobbled) I couldn’t stop smiling. Last year, I thought to myself, I weighed 300 pounds. Now, I just ran 13.1 miles. The sense of pride was real, guys. “30” and I am feeling great! For the first time in I can’t remember, I feel very focused and not worried about eating and what I can’t have. I enjoy cooking and preparing food and my body is much happier. 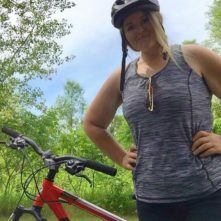 I live in Northern Michigan and also enjoy mountain biking and outdoor excercise and I am looking forward to my athletic clothes fitting better this summer! So far I’ve lost 25 lbs! After reading about your half marathon….who knows maybe I enter one this summer! I’m so glad to hear you’re having all of those benefits!! Whole30 really does change your life, huh? 🙂 I definitely think you should consider doing a half marathon! 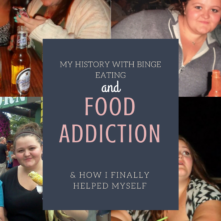 It was one of the highlights of my weight loss journey for sure! What an awesome story – and accomplishment! I love this. I had a similar first half marathon experience. Those last miles were excruciating, but tears and elation crossing the finish line!